Follow me as I continue my "au naturel" hair journey, life as a wife, and experiences as a new mommy. So as you know, I have been on a quest for an alternative to Miss Jessie's regularly priced products. I have no problem buying their products when they are on sale, but I need a cheaper alternative. 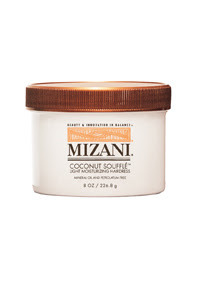 Through a suggestion from one of my beautiful sorors, who JUST did the BC, I bought a container of the Mizani Coconut Souffle. Product Description (from website):Natural coils and curls—and even some wavy hair types—require extra moisture, protection and style control. New whipped-texture, Coconut Soufflé Light Moisturizing Hairdressdisperses evenly and absorbs quickly for touchably soft waves and curls. Using a concentrated, natural-oil blend of coconut and camellina oils, it instantly envelops each strand and infuses it with uniform moisture from the inside out. Additionally, coconut oil helps strengthen hair and reduce breakage. The result is targeted moisturization, along with extra protection at the "stress" points of curly strands. Positive comments: The product is very light and smells good. I used it for my dry twist out last night and my hair feels soft and moisturized today (it is still twisted). There are some good ingredients in the product such as Coconut Oil, Glycerin, Camellina Oil, and Rice Bran Oil. You don't need to use a lot so the 8 ounce container should last a while. Negative comments: The product is a little slippery for dry twist outs and I prefer a heavier, creamy textured product for dry twist outs - that is one thing I love about Miss Jessie's Buttercreme. All in all I would recommend this product as a daily moisturizer and I would purchase it again. But, I am not convinved that this is the best for dry twist outs, but it is great for keeping my kinks moisturized. Miss Jessie's is still in the lead for my dry twist out go-to-product! More Places to Check Me Out! I would love to start doing more product reviews, but my bank account is taking a huge hit already! Please feel free to contribute! How many of yall are curious?